Bishops bash law against bigotry: some things are sacred! This week the Bishops of the Church of England have been busy underlining the point that they shouldn't be in an unelected house holding positions of veto against the will of MPs who at least have a pretence of representing the will of some of the people. The more conservative among them have been lobbying the other Lord's to vote against changes in the law would make it illegal for the Churches to continue some of it's most cherished bigotries: those against LGBT people. Yes the poor persecuted church wouldn't be allowed to treat LGBT people like second class citizens anymore if the government had her wicked way and bishop's - poor persecuted people of faith and conscience - couldn't possibly have that. Isn't it great that we have a second house in parliament to sit in patronising judgement on the first. (sic.). It just goes to show that Christians still can't be trusted with power and will ultimately use it to license abuse of others. Imagine if everyone discriminated in the way the Church chooses to: no homosexuals would be allowed to earn a living in the UK: 1 in 10 people would be forced to live from handouts or through theft or just die. This is what the Church is asking the right to impose on LGBT people. It is saying, in effect that LGBT people should not be accorded the same opportunities as other people and that the example set by the Church is one that everyone should follow. It's hideous and shameful and these bigots need to grow up! Isn't it in fact more fortunate that we are dead to sin and to the law of sin and free to live in righteousness. This means that whether the law of the land tells we can or can't be horrible to people just because they're in a sexual minority and we like scapegoating sexual minorities - we are free to love and include all, all, ALL . but since this admonition seems to be hard to follow perhaps the best way to give for the stricken people of Haiti is with a microcredit organisation. The Lambi Fund is named after a shell that is used as a horn to call a village meeting (for example). Supporting people directly is a good way to circumvent the ongoing US occupation of the country (the third time within a hundred years). Margaret Pfeil of Notre Dame (I think Andy Alexis-Baker studied languages there) has written a little reflection on Dorothy Day here. Among other things she deals with the perennial question of Day's anarchism and Roman Catholicism. It's good stuff. The author proclaims to be a gun lover himself, but he is writing for the unmissable site Antiwar.com. It is about rifles with a night vision devise on which are incriptions. "JN8:12" is a reference to John 8:12: "Then spake Jesus again unto them, saying, ‘I am the light of the world: he that followeth me shall not walk in darkness, but shall have the light of life.’" "2COR4:6" is a reference to the second letter of Paul to the Corinthians: "For God, who commanded the light to shine out of darkness, hath shined in our hearts, to give the light of the knowledge of the glory of God in the face of Jesus Christ." Everyone is worried that if they were captured in combat that the enemy would use the Bible quotes against them in captivity or some other form of propaganda. * "I knew that my God was a real God, and his [a Muslim fighter in Somalia] was an idol." * "The enemy [Islamic extremists] is a spiritual enemy. He’s called the principality of darkness. The enemy is a guy called Satan." may be a company that believes "America is great when its people are good" and that "this goodness has been based on biblical standards throughout our history and we will strive to follow those morals,"
So genocide and slavery are signs of goodness based on biblical standards. So is grabbing the poor and putting them on transport to "colonies" where they can feel better than the coloured humans around them (for that is the way much of the later-to-become USA originally became peopled by English speaking whites). the U.S. military should not be tone deaf to the fact that overt Christian messages on weapons of war perpetuates the belief that the America is waging a holy war against Muslims. It is all a bit much to swallow. Illustrative for what Shane Claiborne writes: "It is hard being a Christian in the United States of America." What word should we use instead of Christian for people who take His words seriously? How ironic should we think this is? ...buying a Brand Product and yet somehow feeling connected to the lofty ideal of Christian or Religious Anarchism. 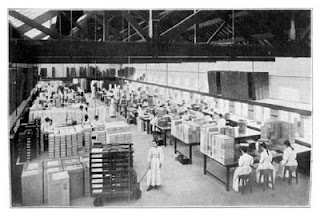 The Cadbury family was the type of entrepreneurs which died out sometime along the recent history of capitalism: purportedly well-meaning towards the workers in the factory and their families. The company started as a provider of a substitute of that scourge of the working class, alcoholic drinks. The scourge remained, Cadbury somehow lost the original meaning. Yet, Beatrice (Betty) Cadbury has a lasting place in the history of twentieth century Christian anarchism, being married to Dutch social reformer and religious anarchist Kees Boeke. the couple working as a team in the anti-war/anti-miltarist movement and starting their own school, De Werkplaats. 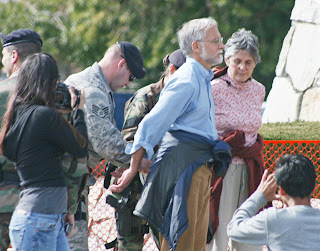 They were founder members of War Resisters International and active prison abolitionists. Having a bar of chocolate with that name on it to me meant for a short while being connected with this history. Silly perhaps, but the brand is not present in my part of the world, so I thought I could and should buy it at British stores in my city or in Britain itself whenever possible. I suppose it had been a silly idea long before the takeover which puts an end to any idea of Quakerism, Englishness and Worker friendly enterprise. Still, I would have liked to remain a bit naive at this point. But the show is really over now. At least War Resisters Inernational and De Werkplaats [for what that is worth] still exist. On Friday, January 22, The Missile Defense Agency will conduct a Ground-Based Interceptor Test, FTG-06, for the missile defense system. Missiles launched from Reagan Test Site, Marshall Islands, and Vandenberg Air Force Base, CA. The test will simulate an Iranian missile attack on the United States. We will assemble in protest on Thursday, January 21, from 4 pm to 7 pm at Vandenberg AFB front gate (6 miles north of Lompoc on Highway One Santa Barbara county). Check the Vandenberg website for cancellation. If test is canceled, protest is canceled. Sponsors include: WILPF, Code Pink, Nevada Desert Experience, and War Resisters League. A few years ago I got in touch with a representative of the UK Chagos campaign. It earned me the qualification of being the Dutch Solidarity Campaign, which only made me feel embarrassed and inadequate - this is very much an uphill struggle, a sisyphean labour. Then I was invited by International Prison Watch to participate and focus on Chagos, this being the unknown Guantánamo of the USA on - officially - British soil. And so there it is: campaigning means blogging, these days, does not it? The Chagos Islands - an archipelago in the Indian Ocean, halfway Africa and Indonesia. Colonised by French plantation operators, populated by slaves taken from other French island colonies in the Indian Ocean. In 1804 conquered by the British who abolished slavery. Plantations and workers however stayed. And then the government of the United States of America decided that the archipelago was of high strategic value and wanted to have the natural harbour of the main island, Diego Garcia, as a navy base - condition was that there should be no human beings snooping around. The islands were detached from the original main island colony, Mauritius, were not given independence and the British government decreed that the population of slave descendants was really an itinerant worker community.Plantations were nationalised and immediately closed down. The islanders were deported, the US navy and air force moved in (1973). In the so-called war on terror the islands are used as a prison and torture camp under the incredible code name of Footprint of Freedom. Although the indigenous people won their court cases against their deportation they are still being denied the right of return. Nowadays, the risk of climate change is the main story why the islands should not be populated. You are invited to gather news and send it to the site. If you would like to contribute to Issue 21 then articles and artwork need to be submitted by 3 March 2010 but it would be great to get your proposals by the end of January at the latest. This magazine is read by academics and activists, usually calling their selves Christian, who are interested in how anarchist theory and practice can challenge and inform their faith. It is also read by anarchists interested in Christianity and by other interested people and groups. A lot of the readers are peace activists and interested in direct action but many have rejected direct action. Many are involved in or thinking about alternative ways of being community or Church. The magazine is free to anyone who asks for it but readers who don't enter into dialogue with the magazine will eventually be dropped from the mailing list. We're not a bleedin' charity, mate. Highlight ways in which mutualist or communist anarchism informs traditional Christian belief and practice. Critique some of the 'sacred cows' of the radical Christian left. These hints are intended to help you engage our readers' attention and interest. They are based on advice given to writers of "Peace News" a fantastic campaigning paper also based in the UK. Please don’t spend too much time on a piece in advance of commission or agreement on our part. Not everything submitted is published. News items are not published in A Pinch of Salt. This is an occasional journal. However, reflections on activities and stories about events that include some analysis and explanation are welcome. We prefer story-tellers to use the first person and to be clear about their own role, their own point of view, and their feelings. Make suggestions for further actions. If there's something you're not sure about, and cannot check yourself, tell us about it, and in the text either mark it as “to be checked” or leave it out. Is there any image that would get through to readers, or a graphic or photo to illustrate your report? Liven up the article with quotes in direct speech from people involved.. Please send an extra line describing yourself for the “note” which sometimes appears at the bottom of longer items. Let us know where the reader can find further information. About 400 or 800 words. Assume no prior-learning from your reader: avoid technical language where possible and use simple words (It's funny but it's not humorous) this makes for friendly more readable style. Try to humanise the story, with examples drawn from life and quotes from people involved. Please suggest a graphic or source of graphics, especially photographs. Who publishes A Pinch of Salt? Essentially it's one bloke in a shed but watch this space as the magazine either develops or – hey – folds! The current editor is Keith Hebden, 58 Haycroft Drive, Matson, Gloucester, GL4 6XX. Normally we will suggest a length of 400 or 800 words if there is a longer version on-line it can be referenced at the end of the article. Obviously there is some flexibility about length, but try to keep near what's suggested as some aspects of the article may have to be cut out. The magazine is A5 and it keeps it simple to fit a piece to one or two pages exactly. The magazine is intended to introduce a variety of subjects rather than explore at depth from one persons perspective. After cutting an article, often we will not have the time to send an article back to you for your approval, although we will always try to consult you except if it came late. How to send in your copy? In time! If you think you're not going to reach a due date please email the editor as soon as you think this is the case. Editor.apos@googlemail.com If sending electronic copies you can use .doc or .odt or .rtf but not .pdf. If you send a piece as an email message it will be returned as a .odt as default. OpenOffice Software is available free online so you don't need to by Microsoft Office. Editing for presentation: certain design and typographical techniques are used in presenting the article. You can make suggestions for use with your article. “boxes” and “sidebars” are ways of extracting information from the body of the article and presenting them alongside it (eg; a case study or background information). A Pinch of Salt rarely includes these as there isn't space. NOTE: please suggest a headline: if that's the one you really want, say so; otherwise, don't be surprised if it's called something else (depending on the space and shapes available). Consistent English: A Pinch of Salt uses British usage unless there is a reason to use another English. There is also a wide range of preferred forms of words and typographic styles. There are also some political preferences for instance, the use of inclusive and non-sexist language, and preferences in the naming of places and peoples. Editing for sense: this includes more substantial rewriting of sentences in order to make the writer's prose clearer and more accessible. This might mean the editors or a helper doing further research (if necessary, getting back to you) to clarify certain points. Editing for accuracy: This also can include checking for libel (defamation): English libel law is comparatively tough. And as libel is normally a civil matter, there is no investigation by police or other authorities before a case goes to court; the plaintiff only needs to allege that an article was libelous for proceedings to begin. Please try to use inclusive and non-sexist language. If you have to use concepts such as imperialist, fascist, neo-liberal, etc, please be precise. We do not accept unsolicited poetry. If you have any ideas for a news piece or article, please contact us. All contributions and feedback is appreciated. that there will be no payment for texts submitted. All contributions are made on a strictly voluntary basis. The rights granted may be exercised in any form or media in which the work may be reproduced, published, distributed, or displayed (including but not limited to compilations, microfilm, library databases, videotext, computer databases, CD-ROM, and the Internet). We reserve the right to accept or reject any article submitted. Language – nonsexist/racist/homophobic etc – unless it is very specific. People do have gender(s), and do identify as being from different races/sexualities etc – so sometimes it is correct/accurate to represent them as such – use your judgement. All publication names should be in single quotes. Represent dates as Saturday, 4 March 2002. Not 04/03/02 or March 4th 2002 or any other way. Represent contact details like this: Name, postal address, country (tel +int code; fax; email; http://web). Try and be sensitive about country/place names (for example, Palestine/Occupied Territories is ok for West Bank, Gaza etc, Israel-Palestine for everything else). Try not to land us in court! Please do not post anything which is plainly libellous! If you are writing about a big company make sure your facts are right and that you can back them up if challenged. If you get time and the story is not about your own group, send the group a quick email about how you added their news to our site. This is a good and fairly painless way of networking with loads of people and of promoting the magazine to new partners. If anyone would like a text only version of issues 15, 16, 17, 18, 19, and / or 20 please send me an email. It will be in pdf and will be literally (sic.) just the words. If you'd prefer a text only electronic copy in future (or would like to be subscribed to both) let me know in the same email. It strikes me that both the worship of the wafer and the obsessive monotheism of Christianity are symptoms of a religion that has grown up in the context of civilisation and empire. The Eucharist is a profound symbol of Christ's presence among us and his brokenness for us of a meal celebrated by and for all. But it is also a fetish of the staple food of civilisation - bread. Bread being from grain and grain being a food that only thrives in disaster-hit land and denudes it of both richness and moisture. So we search for more land and more water - destroying fertility, settling other people's hunting grounds, creating nations, salinating and desertifying land. The history of civilisation in a nutshell / grain kernel. Judaism and therefore Christianity developed from henotheistic nomadic anarchy into monotheistic urban monarchy and with it the mores and liturgies of religion. It may be that only paganism can save Christianity from it's imperialism. And why not? One good turn deserves another. The early British Christians 'Christianised' pagan Britain perhaps it's time modern animists paganised Christendom Christianity. Perhaps then the symbol of wafer and credo monotheism can also be saved. Personally, I think they're worth saving. There were days before there was television, and there were days before New Year's Day did not mean the yearly fix of Strauss and the likes from Vienna. Since we were not first or even among the first million to have a television set I should even remember what it was like. But then, it looks like a really old tradition which makes it impossible to think of how it was without it. But since when was not it enough to be the Wiener Philharmoniker, be proud of having a world wide audience, so there had to be some Brand to "support" it (it was mentioned at the BBC transmission, probably a compulsory mention)? I can probably look up the fatal year on the net, it must be in the era of Total Ideological Market Dominance - we are living in the end time of that era now I'd say. I never felt any urge to imitate the behaviour, thank you very much, but there were times when some daredevils took a New Year's Day plunge in the sea, whatever the weather, whatever the temperature. Since the North Sea water is relatively warm in midwinter there was some logic about it, apart from its being a ritual. I would not know whether there still are autonomous divers at beaches far away from any onlooking crowd, who persist in this tradition, but at well-known seaside resorts in NL there was no escaping television registration of the plunge. And so this spontaneous activity duly had to be supported by a nasty multinational as well. A multinational which repeatedly warned against taking the dive because "of the temperature". As if anyone asked them! Starting the year with - for days on end in the worst case - the Radetzky March in mind, a militaristic tune celebrating a Habsburg Monarchy general who failed to vanquish the Prussians - it is sad when you think of it. If he had prevailed, how different would the world have looked? Not more peaceful, but very different anyway. What a tune to start the year with. Consciously or not, Jools Holland's Hootenanny closed on a completely opposite note in the New Year's night: an All Guest Star performance of the spiritual Down by the riverside. One of the guests was Boy George. They had a repetition of the tune earlier in the year 2009, you can read the words - they are based on Scripture.